Ok. I lied. I said this was going to be a winter themed doll, but I changed my mind. I messed up the pictures for the winter doll I was going to do, but I had these pictures I took of these guys. They're sort of wintery. They're Christmasy. 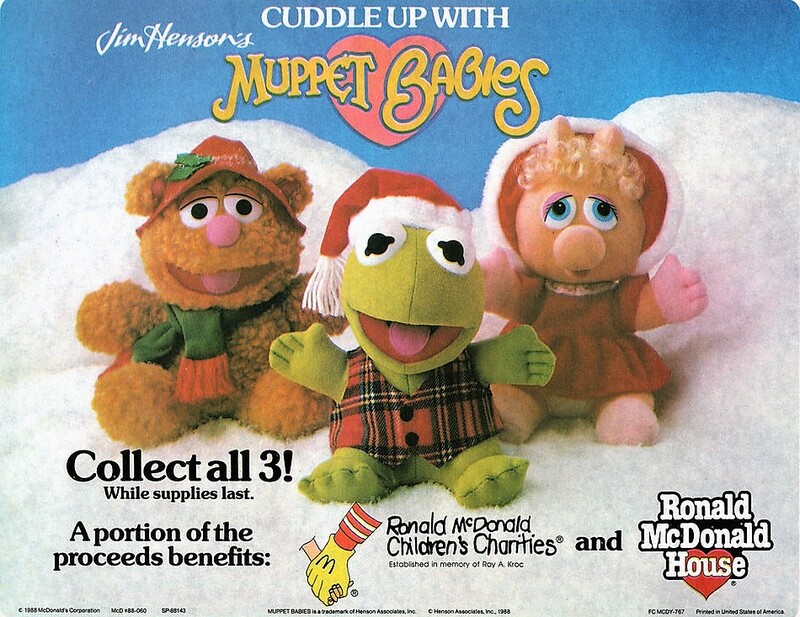 What you may not notice is that they are meant to be the Muppet Babies versions. "Muppet Babies" was a popular animated series at the time,airing originally from 1984 to 1991. There were a lot of dolls, toys and other products released from it. Emma was born in 1991, and I bought plenty of Muppet babies toys and stuff for her. Her first calendar, which I kept track of her baby milestones on, was a Muppet Babies one. 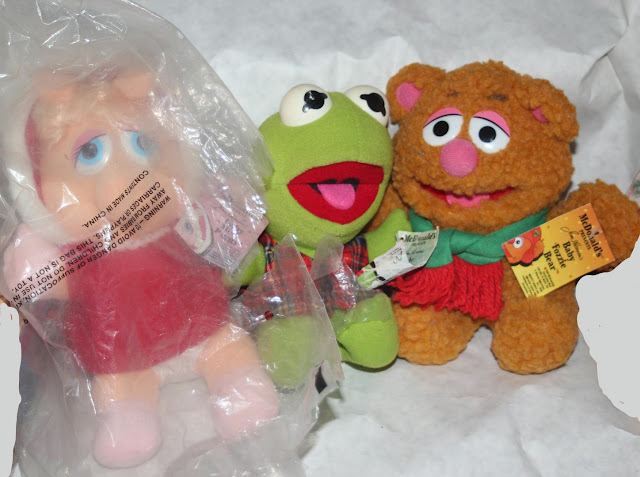 Miss Piggy was still in her bag, but the bag is disintegrating more every time it's touched. Fozzie is missing his floppy red hat, and Kermit is missing his Santa hat. This is what happens when dolls have removable clothes! Kermit's vest and Fozzie's scarf are also removable. Miss Piggy's bonnet isn't removable, but she has comb-able hair. They were sold in 1988,in part to raise money for Ronald McDonald House. They weren't Happy Meal toys, but were sold separately as an option when making any McDonald's purchase. Kermit and Fozzie are about 7 1/2" tall, but Piggy is about 8 1/2". You can see two different commercials for the toys HERE and HERE. Tomorrow we'll see that wintery doll.